On the official site it is shown a range of 215 miles but in the unveil Elon said the range it will be this at minimum so the final range might change either by default or by additional options. In august 2016 Tesla announced that they have a new battery option of 100Kw for the model s and x that offers 315 miles on a single charge making it the biggest electric car range, and getting close to curing the so-called range anxiety, when driver travel longer distances in electric cars. This battery pack will be available to the higher end the s model and maybe x as well, but we will see if it will be available on the cheaper model 3 as well. Charging the bateries can be done either at home or at charging station or using one of tesla supercharger station. 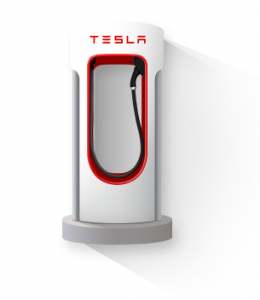 A supercharger station can charge 120kw in 30 minutes giving you 120 miles of range. As with all litiu-ion batteries it is recomended for best battery life to charge it 80%. It converts the kinetic energy of the moving car back to electricity to fill the battery. It is not a perfect world and not all of the cars energy is put back in the battery as there are loses by friction either aerodynamic or rolling friction by the tires that limit the available energy plus the double conversion from battery to wheels and back, that although is super high 80% compared to an internal combustion engine of 30%. The regen braking is controlled by the motor controller that feed current to the motor windings and create negative torque slowing the car and sparing the brakes. This is generated from the position of the throttle pedal. It can either slow the car until a complete standstill or just slow it down and still let you coast. 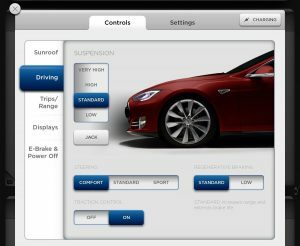 On model S regenerative braking has two options standard and low. This is what will allow to supply all the batteries needed to manufacture all the model 3s. It should make enouth batteries by 2018 of equivalent to 500.000 model 3s and when it will reach full capabilities it will provide batteries for 1.5 milion model 3s per year starting the transition to electric cars. In cooperation with Panasonic the Gigafactory will produce cheaper lithiu-ion batteries and it is expected to lower the price per kWh cost of batteries by 30 percent.